Aquaponic is a complete organic system that does not rely on the use of pesticides, fertilizers or man-made chemicals to sustain the food production process. The natural ecosystem that combines aquarium fishkeeping and vegetable planting into one complete package is actually easy to manage once you have reached the equilibrium stage whereby everything is already self-sustaining. But before we move on to that level, let us first examine the requirements and other technical aspects to help you get started. Note that, if you already have some basic understanding, you might just continue to read on, or else, you can just check out my previous post to understand about the underlying concept of what an aquaponic system really means. This is basically the first and foremost requirement. An aquaponic system which is too small can be quite impossible to maintain because high concentration of waste (ammonia buildup) during the initial stage can be poisonous to both your plants and fish. Even after the system has already stabilized, if you have a large setup in place, any upset or deviation from the standard control parameters (like for instance pH, temperature or nitrate content) can make very little to no difference at all. The minimum area should be at least 120 square feet (or roughly 13 square yards) and of course, the larger the space you can allocate, the better. Don’t worry when it comes to choice of location because there are quite a number of aquaponic enthusiasts who are successful at setting up their system in their basement. Of course there are those who prefer having it in the garden or open-air backyard, but there’s nothing to worry about because whichever location that you choose, just make sure that you have proper lighting to act as natural sunlight. Pumps (make sure that it is sized according to the desired flowrate). A standard size aquaponic system with a 100-gallon fish tank to support 50 square feet (2 feet depth) of vegetable growth bed would require minimum 200 gallons per hour of flowrate. The calculation here is made on the assumption that you will be using a timer to let the pump alternate start stop every 30 minutes. Sprinkler. This is needed to spray and distribute the water from your fish tank to your growing vegetable bed. However, depending on how you run the piping, it may not be necessary to have it as some people actually run the piping directly underground at the bottom of the vegetable bed. Let’s look at the proposed configuration which I’ve detailed out below. As you can see from the drawing which I’ve attached, basically (A) from the fish tank, you will need to pump the water going to your vegetable bed and distribute evenly to all the areas of the plants. The nutrient rich water will seep underground and will eventually fill up the bed until it reaches the overflow pipe level (C). Meanwhile any excess water will also get returned back to your fish tank via the pipe installed at the bottom bed (B). After running for 30 minutes, the pump will stop and the remaining water will continue to drain off via the bottom pipe. Note that the 30 minutes interval will very much depend on which type of vegetable you intend to grow because certain plants may not need to be watered frequently. Also during the time the pump is not running, it might be a good idea to install an aeration device to stir up the water in your fish tank to continue to provide the much needed oxygen. Which is the best fish for my aquaponic system? To be frank, there is really no right answer for this. 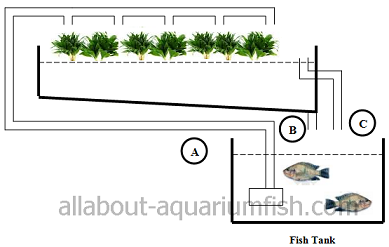 Any type of food fish would fit in nicely but the most popular that every aquaponic enthusiasts would really focus on today is definitely tilapia. The fish being a hardy freshwater species will grow fairly fast to achieve a sizable body mass, rarely develop disease complication and is definitely not picky when it comes to feeding time. However, if you do not have the intention to breed food fish and instead prefer beautiful ornamental fish, then you can opt for gourami or even Japanese koi. All these are up to you to determine. Do you really need worms? The answer is “Most Definitely”. Presence of worms is not only beneficial for your plants (as it helps to decompose the waste and loosen the soil), any excess can actually be used to feed your fish. However, the most common mistake that every enthusiast made is to introduce the worms too fast into the aquaponic system, only to discover that all of it will eventually die off. The point that I want to stress here is that what is more important is to let the system slowly establish itself and then let the worms grow naturally. Many people that I know go to certain extent to introduce some non-native species, but somehow you might not realize that they might already been there after all.